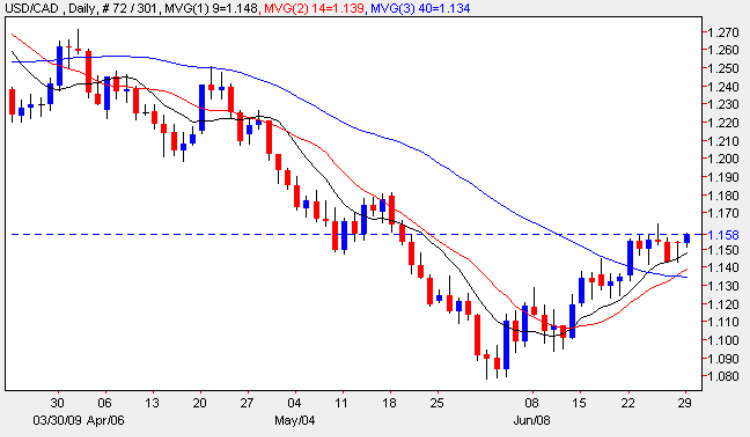 Whilst Friday’s candle added to the general sideways consolidation of earlier in the week for the usd to cad pair, the low of the day found strong support from the 9 day moving average, suggesting once again that this reversal has still got some “legs”. With the 14 day now crossing back above the 40 day moving average and with the latter about to turn this would now seem to support this view but for any longer term trend trading we need to see a sustained break and hold above the resistance level now created in last week’s trading at the 1.15 level. Should this occur then we may even see an attempt to break above the 1.175 area which could, in turn, lead to a test of the strong resistance now in place at 1.2. Much of this will depend on the global view of the US Dollar where the consensus of opinion is for a further weakening despite the helpful comments from the Chinese who suggested that it would kept as the world’s reserve currency for the time being. The picture is further complicated by the Quarter End with many hedge funds and institutions squaring positions which generally leads to dollar weakness as a result and which stall any upside moves. This week is, of course, dominated by Non Farm Payroll which will be released on Thursday, as Friday is a national holiday for the 4th of July celebrations in the US. This is preceded on Wednesday by the ADP figures and tomorrow we have the GDP month on month for Canada with an expectation of -0.1% against previous of -0.3%, an improving picture.